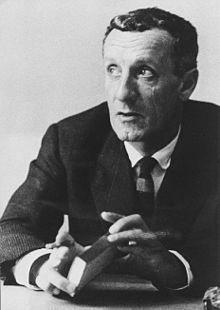 Maurice Merleau-Ponty (March 14, 1908 – May 3, 1961) was a French phenomenological philosopher. Language transcends us and yet, we speak. The function [of objective thinking] is to reduce all phenomena which bear witness to the union of subject and world, putting in their place the clear idea of the object as in itself and of the subject as pure consciousness. It therefore severs the links which unite the thing and the embodied subject, leaving only sensible qualities to make up our world (to the exclusion of the modes of appearance which we have described), and preferably visual qualities, because these give the impression of being autonomous, and because they are less directly linked to our body and present us with an object rather than introducing us into an atmosphere. But in reality all things are concretions of a setting, and any explicit perception of a thing survives in virtue of a previous communication with a certain atmosphere. Even those who have desired to work out a completely positive philosophy have been philosophers only to the extent that, at the same time, they have refused the right to install themselves in absolute knowledge. They taught not this knowledge, but its becoming in us, not the absolute but, at most, our absolute relation to it, as Kierkegaard said. What makes a philosopher is the movement which leads back without ceasing from knowledge to ignorance, from ignorance to knowledge, and a kind of rest in this movement. Socrates reminds us that it is not the same thing, but almost the opposite, to understand religion and to accept it. Lichtenberg … held something of the following kind: one should neither affirm the existence of God nor deny it. … It is not that he wished to leave certain perspectives open, nor to please everyone. It is rather that he was identifying himself, for his part, with a consciousness of self, of the world, and of others that was “strange” (the word is his) in a sense which is equally well destroyed by the rival explanations. The philosopher will ask himself … if the criticism we are now suggesting is not the philosophy which presses to the limit that criticism of false gods which Christianity has introduced into our history. Philosophy is in history, and is never independent of historical discourse. But for the tacit symbolism of life it substitutes, in principle, a conscious symbolism; for a latent meaning, one that is manifest. It is never content to accept its historical situation. It changes this situation by revealing it to itself. This page was last edited on 7 January 2018, at 14:27.